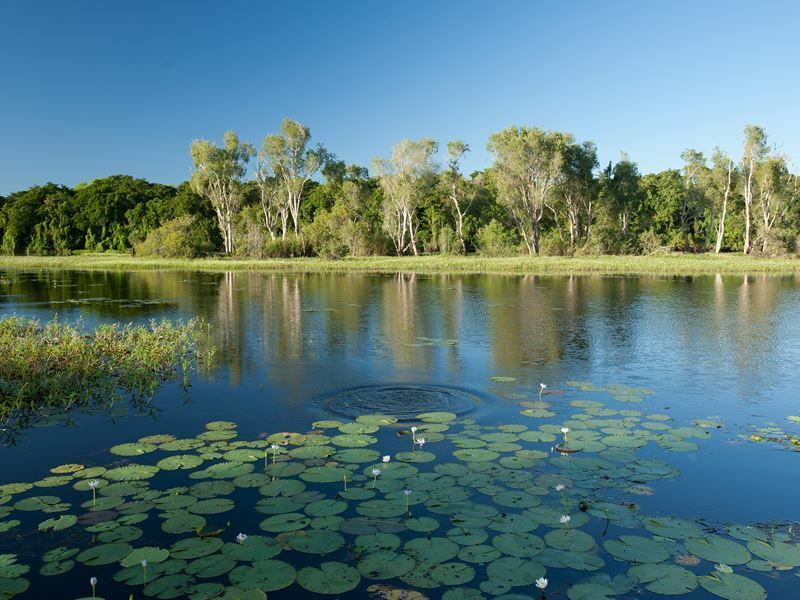 Why visit Kakadu & Katherine? Kakadu National Park, along with Uluru, is a must-experience in the Northern Territory, and one of the most transformational travel experiences you can have in all of Australia. This UNESCO World Heritage site that’s jointly managed by Australian park officials and the Mungguy/Bininj people, might just change the way you view the world. A biodiverse wonderland, you’ll discover everything from ancient Aboriginal rock art and thundering waterfalls to giant crocodiles and exotic birds, along with the opportunity for a wide range of outdoor adventures. No matter what time of year you visit, there is always something to see and do in this park. The dry season is from April to October, while the tropical summer, or wet season, is from November to March. While some of the attractions become inaccessible once the major rains set in, this period can actually be a great time to come and witness the striking natural beauty of the park, and enjoy more affordable accommodation prices too. If you visit early in the dry season, in April or May, you can enjoy some of the benefits of both, like the waterfalls that will still be magnificently cascading while also missing some of the biggest crowds of the year. The middle of the dry season, about mid-June to mid-August, is the peak season, meaning it’s likely to be quite busy with families that visit during school breaks, although this is also the time for some of the best weather, with an abundance of sunshine and little rain. You can get to Kakadu from either Darwin or Katherine. By starting in Darwin, you’ll be able to experience a several outstanding destinations nearby as well as a number of attractions in the tropical city itself. 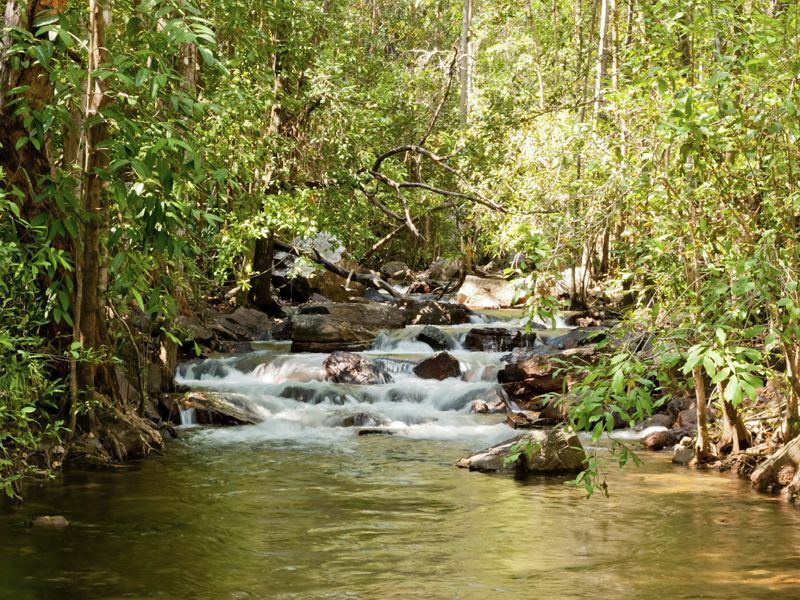 Here you can swim with the toothy crocs the country is so well-known for, from within the safety of a tube known as the “Cage of Death,” and if you want to get wet in the wild, head south of town for about an hour to Litchfield National Park. This park is home to multiple crocodile-free pools that are fed by gorgeous waterfalls, and is ideal for a cool, refreshing dip. From Darwin, it’s about a three-hour drive to the park. You can hire a vehicle to explore it on your own, or take a tour. If you’d like to take advantage of a knowledgeable expert and avoid getting behind the wheel, there are multiple tours to choose from. The less time you have, the more a tour makes sense as it will save you the time it takes to pick up a vehicle, stock up on supplies, and organising it all. You won’t have to drive around looking for things and trying to find someone to get information from either. While there are day tours available from Darwin, keep in mind that you’re going to spend most of that time getting there and back. Even with a full 12-hour day, that leaves just six hours to experience the park, making a multi-day tour really a must. 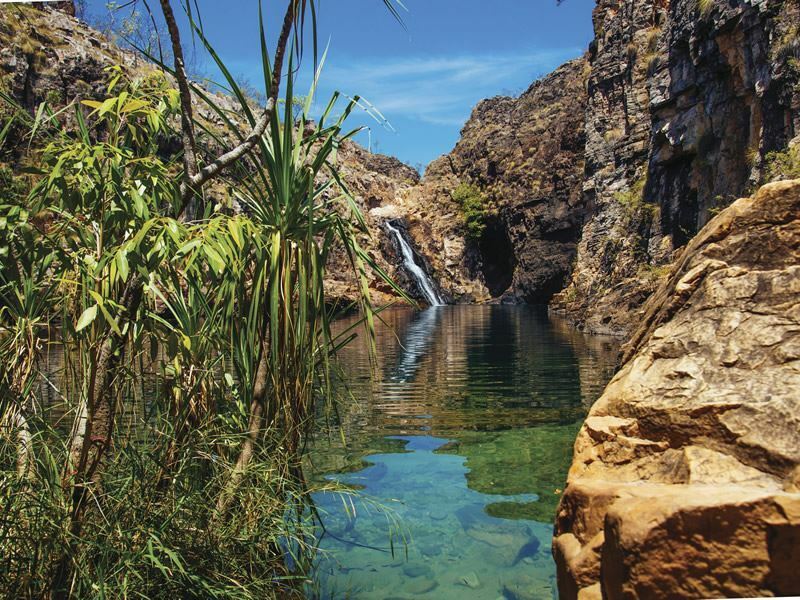 The Tropical Top End Tour is a four-day, three-night excursion that includes a number of activities which vary with the season and will get you up close and personal with Kakadu. You’ll be able to do things like view Aboriginal rock art, take a guided walk to the top of Ubirr, embark on a cruise to see exotic wildlife, including saltwater crocs, visit the Warradjan Aboriginal Cultural Centre, and more. The tour also allows you to enjoy a more well-rounded Australia experience, with a visit to Litchfield National Park and even a Katherine Gorge cruise where you’ll see crocs soaking up the sunshine along the way. For something even more in-depth, the five-day, four-night Kakadu’s Ancient Secrets Tour includes lots of time in the park as well as the option for a flight over this breathtaking region for a bird’s-eye view of Kakadu and Arnhern land. Some of the other highlights are Nitmulik National Park, a tour of Ubirr to view the Aboriginal rock art, a wildlife watching cruise and other bird and wildlife watching opportunities, Litchfield National Park and more. An independent road trip can be enjoyed by hiring a vehicle in Darwin, with two-wheel, four-wheel and even motor home options available. The park isn’t too wild or dangerous, as some might imagine having seen one to many reality TV survival shows. It’s easy to drive to and through Kakadu, in fact, the park is quite well-developed. Note: Don’t try to cram everything all in in just a day. This is the biggest national park in all of Australia at over 7,722 square miles. Absorbing the true spirit of the land just can’t be done in one day. 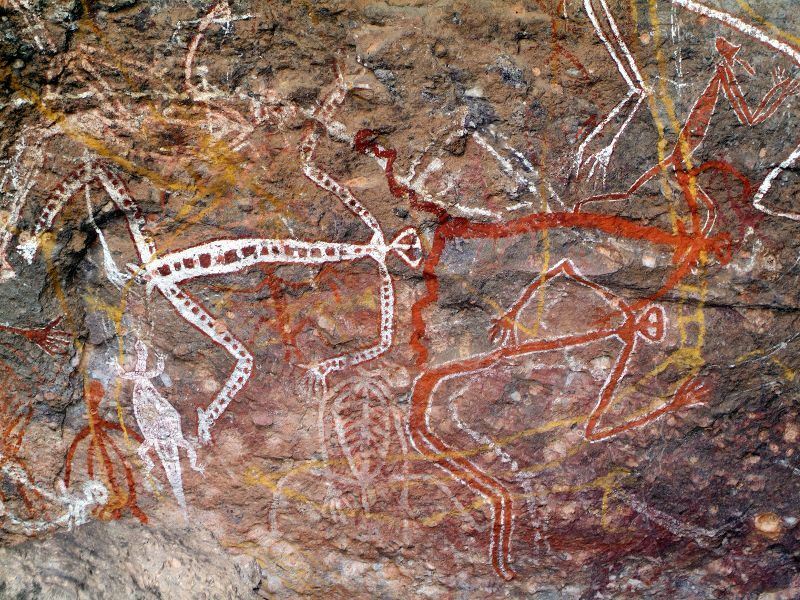 Aboriginal rock art. The park is home to ancient rock art that dates back 20,000 years – the oldest recorded rock art created by any group of humans on Earth. It can be viewed at Nourlangie Rock by following the less-than one-mile Nourlangie Rock Art Walk. For a bigger challenge, the 7.5-mile Barrk Sandstone Walk offers some amazing vistas, as does the Ubirr climb that ascends a a little over 800 feet to Nadab Lookout, especially impressive at sunset. Yellow Water boat cruise. 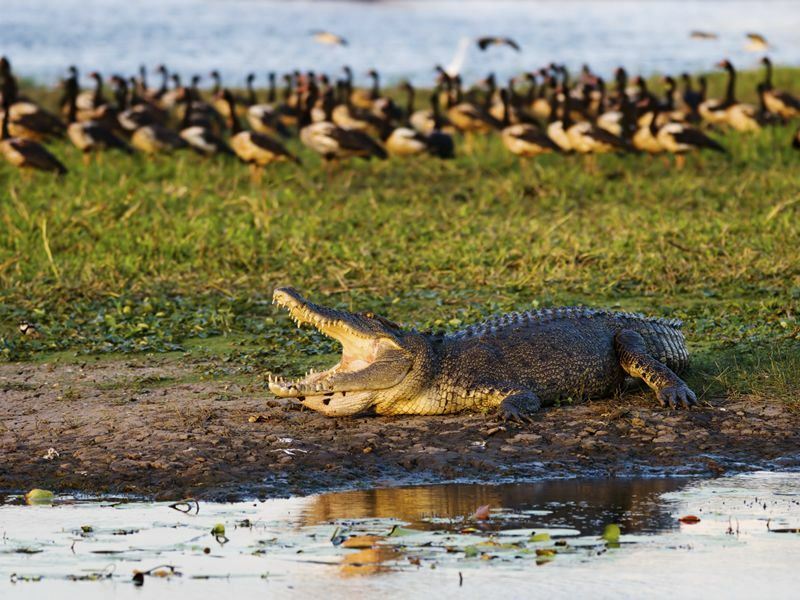 An adventure through the magical wetlands on a Yellow Water Boat Cruise brings the opportunity to witness about one-third of all the park’s bird species, along with an endless number of crocs. It operates year-round and offers both 90- and 120-minute excursions, which include an expert guide. For the ultimate experience, try to book a sunrise or sunset cruise. You’ll have to book well in advance, but you’ll be rewarded with a stunning display of colourful hues across the wetlands. Maguk Gorge. If you hire a four-wheel drive vehicle and the road conditions allow, you can visit Maguk Gorge which is in the southern region of the park. It requires about a one-and-a-half-mile trek once you reach the trailhead. You’ll walk through thick vegetation and lush forest that’s home to all sorts of lizards and birds before opening up to the only year-round flowing waterfall that plunges into a swimming hole. The more adventurous use it for cliff jumping. Yurmikmik Walks. The Yurmikmik Walks are a series of interconnected walking routes that are particularly ideal during the wet season. They range from a 1.25-mile loop to a more challenging 8.7-mile loop. The Motor Falls Hike is about 4.7 miles and will bring you through the southern hills and ridges. Along the way, you might spot lorikeets and hooded parrots, wallaroos, cockatoos and more. The last quarter mile or so leads through a monsoon forest and a plunge pool at the end where you can take a dip under a waterfall. Bardedjilidji Walk. If you’re looking for an easy but rewarding walk, the Bardedilidji Walk can be accessed during the dry season and follows a slightly over 1.5-mile trail that features some interesting sandstone rock formations along the banks of the East Alligator River. Look for the Aboriginal rock art, explore the caves and watch for the unique wildlife and plants that reside in the area. Animal Tracks Safari. The ‘bush experience of a lifetime’ as it’s been called, is the tour offered by Animal Tracks Safari. This dry season activity begins at Cooinda Lodge near Yellow Water Billabong at 1 p.m. daily, and you’ll return by 8:15 p.m. that evening. The authentic bush experience includes a visit to a local buffalo farm followed by an Aboriginal guide-led walk through the wilderness to gather food. You’ll learn about bush medicine and even make a feast as the sun goes down. You can help make the campfire and learn traditional cooking techniques while enjoying the spectacular sunset view. Warradjan Cultural Centre. Learning about the Aboriginal people who’ve lived in this area for more than 50,000 years is a must. You’ll see evidence of their long existence throughout the park, via numerous sacred sites as well as the ancient rock art. The traditional owners are the Binij/Mungguy, who welcome visitors to learn more about their traditional culture at the Warradjan Cultural Centre. Situated near Cooinda Lodge, it’s easy to access, and you’ll get to see lots of unique works of art, many of which are created by local artists, some of it for sale. Many visitors to Australia are excited for the opportunity to see its unique wildlife, and this awe-inspiring landscape is the home of about one-fifth of all Australia’s mammals, one-third of its bird species and over 2,000 plant species. If you’re fascinated by crocs, you’ll be happy to learn that there are some 10,000 of them here, both freshwater and ‘salties,’ which are large estuarine crocodiles. The dry season is the best time for viewing them as they tend to concentrate in water bodies that are ever-shrinking during this time. Just be cautious because where there is water, there may be crocodiles, and you’ll want to be a safe distance away. Other wildlife highlights include wallabies and kangaroos, wallaroos, wallabys, quolls and dugongs, which are found in the coastal waters. Bird species include the hooded parrot, lorikeets, rainbow pitta, the endangered Goudian finch, a variety of herons, pelicans and geese, among many others.